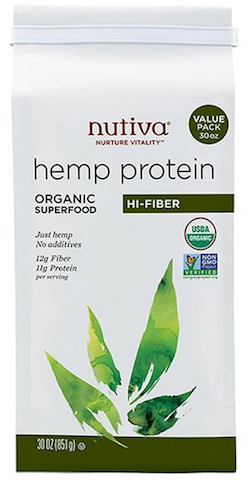 Nutiva Hemp Protein Powder with Hi Fiber 30 oz. Hemp contains high quality plant protein with branched-chain amino acids that are vital for good health. It also has all nine essential amino acids plus the bonus of good for you essential fatty acids (2g per serving). This hemp protein powder contains 66% edestin (a bioactive globulin protein that's easy to digest) - more than any other plant!. With 37% protein, 40% fiber (90% insoluble, 10% soluble), magnesium, iron and zinc, and beneficial fats, this Hemp Protein Hi-Fiber is one of nature's perfect superfoods. Hemp protein powder has the added distinction of being gently cold-processed, without the use of hexane, a harsh chemical solvent used to process non-organic soy protein powders. Directions: Mix 2-4 tablespoons with 8 ounces of milk or nondairy milk and a favorite fruit. Add 3 tablespoons Nutiva Hemp seed (for 22g of protein and 3.5g of Omega-3) for a creamy, nutty flavor. Consider adding a dash of vanilla.